The grounds were a mix of scrub willows, poplar trees, native grasses and plants too many to mention. The fireweeds were bursting in bloom with their glorious fuchsia color. As we drove to the grounds, the green hillsides were infused with their brilliance... and so was I. On the first day, I judged the Seniors with Jason Givens, from Wisconsin, and the Juniors and Masters with Maggie Lindsey, from Alaska. Maggie... what can I say about her? Well, she is as true an Alaskan as I could ever imagine. She works for Fish and Game. Maggie is an avid bird and big game hunter along with her husband, Keith. She flies her own airplane and is incredibly strong - inside and out. 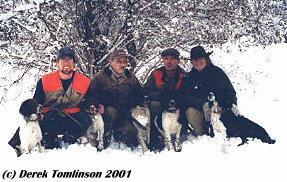 Maggie has hunted with dogs most of her life. Her last three dogs were springers. She is fairly new to the AKC Spaniel Hunting Test, although her show springer, Molly, was one of the original Juniors in 1999. Her present dog, Scout, is out of Rose's daughter, Josie, and Jeff Miller's Glover. Scout hunts with Maggie and Keith every chance they can get. This weekend, Scout used her great hunting instincts and earned a Senior Leg. I have found a new hero in Maggie. She brings to the Hunting Test a knowledge that so many lack... real hunting experience. 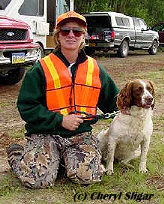 As a matter of fact, most of the Alaskan spaniels are, first and foremost, personal gun dogs. They hunt Willow, Rock and White-tailed Ptarmigan, Spruce grouse, plus several different species of duck and geese... and it shows. Of the thirteen dogs, six NQ'd. Amazingly, out of seven Masters, mostly made up of 2-3 year old dogs, four Qualified! I want to add that the dogs that NQ'd were no slouches. They were young, talented dogs, and will certainly see their day as they mature and their handlers continue to learn. These dogs are owned and handled by people who most likely have only seen hunting tests in Alaska - once a year - and have probably never seen a field trial. The first day's forecast was for rain. The morning was cool and overcast. A slight breeze and the lightly dampened cover brought great scenting conditions. Chukars were used for all levels. They cooperated for the most part, only moving slightly, which intensified the scent. Just before lunch, it started to rain, and the birds were getting wet. We had several traps during the Master, and I have to say that I was impressed with how tender of mouth all of these dogs were. Although some dogs throughout the day NQ'd the hunting portion, the committee invited all Senior and Master dogs for the Hunt Dead. Every dog succeeded and it was off to water.